A member of the Central American migrant caravan, holding a child, looks through the border wall toward a group of people gathered on the U.S. side, as he stands on the beach where the border wall ends in the ocean, in Tijuana, Mexico, April 29, 2018. An audio recording was released Monday depicting children desperately crying and begging for their parents after being separated from them by U.S. immigration authorities at its southwestern border, sparking new outrage against the Trump administration and its new "zero-tolerance policy" towards illegal immigrants. The nearly eight-minute long recording was released by ProPublica, an independent, investigative news site. ProPublica says an unidentified whistleblower passed on the recording to a civil rights attorney, who gave it to the website. Among the disturbing sounds heard on the recording was a child identified by ProPublica as a six-year-old girl from El Salvador begging authorities in Spanish to call her aunt to pick her up from the detention center. At one point in the audio, a man identified as a Border Patrol agent said in Spanish over the cries of scores of children: "Well, we have an orchestra here. What's missing is a conductor." President Donald Trump defended his administration's policy of forcibly separating children from parents at the U.S. border with Mexico on Monday, saying “The United States will not be a migrant camp and it will not be a refugee holding facility." Nearly 2,000 children were sent to mass detention centers or foster care from mid-April to the end of May, according to government officials. The regular White House briefing was delayed several times Monday amid the furor as officials huddled with Trump in the West Wing. Press Secretary Sarah Huckabee Sanders finally introduced Department of Homeland Security Secretary Kirstjen Nielsen by late evening, and she defended the administration’s “zero-tolerance” policy that is breaking up families at the southwestern U.S. border. Nielsen forcefully pushed back at the negative media coverage, asserting that what U.S. authorities are doing is properly enforcing the law. “What has changed is that we no longer exempt entire classes of people who break the law,” she said. Trump's Republican party controls both chambers in Congress, and the family border policies were set by his administration. Kaine, a member of a subcommittee on children and families, was his party’s vice presidential nominee on the ticket with Hillary Clinton, which lost to Trump and Mike Pence in 2016. Kamala Harris, one of the two Democratic Party senators from California, the most populous state, called Monday for Nielsen’s resignation. House Minority Leader Nancy Pelosi also added her voice to those calling for Nielsen to quit her post. Both Nielsen and Attorney General Jeff Sessions, in speeches to a law enforcement group in New Orleans earlier on Monday, defended the administration's stance. 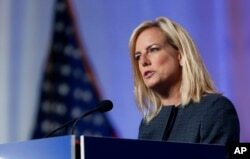 U.S. Secretary of Homeland Security Kirstjen Nielsen speaks at the National Sheriffs' Association convention in New Orleans, Louisiana, June 18, 2018. Sessions said that while the Trump administration does not want to separate children from their parents “we cannot and will not encourage people to bring children by giving them blanket immunity from our laws." In a rare rebuke of the United States, United Nations Secretary-General Antonio Guterres said migrant children should not be separated from their families at the U.S.-Mexico border. “Children must not be traumatized by being separated from their parents. Family unity must be preserved,” a spokesman for Guterres said in a statement. “This is a manufactured crisis. It is not necessary to separate parents and children to effectively enforce the nation’s immigration laws,” said Doris Meissner, who was commissioner of the Immigration and Naturalization Service for seven years during the Clinton administration. 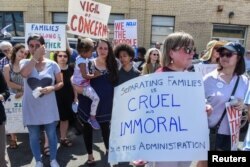 People participate in a protest against recent U.S. immigration policy that separates children from their families when they enter the United States as undocumented immigrants, in front of a Homeland Security facility in Elizabeth, New Jersey, June 17, 2018. The House of Representatives is preparing for expected votes this week on major changes to U.S. immigration laws. Trump is scheduled to meet with House Republicans on Tuesday to discuss two competing Republican immigration reform bills. Sanders on Monday told reporters Trump is willing to sign either bill. Both would provide legal status to hundreds of thousands of undocumented immigrants brought to the United States as children, make sweeping changes to legal immigration, and boost U.S. border security. However, it is unclear if either will attract enough votes to pass.